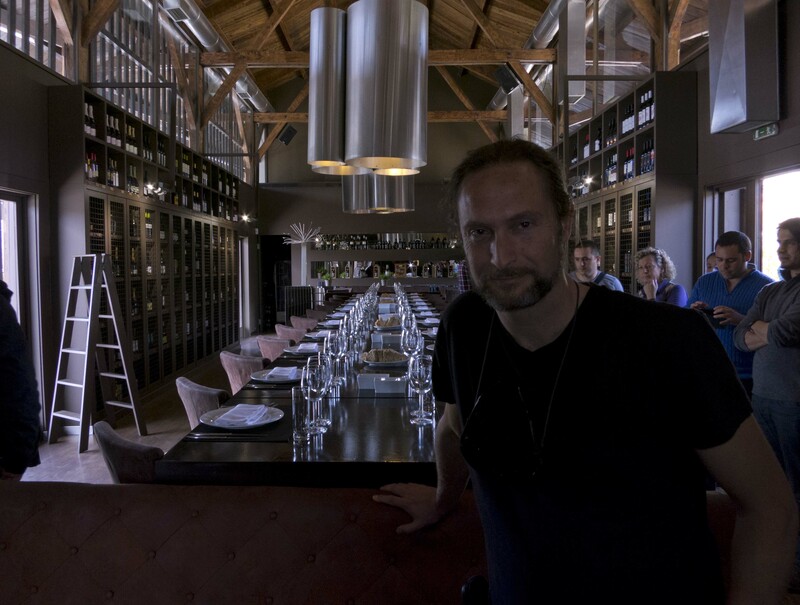 Is it possible to visit five wineries in just two days while driving about 2.000 km? Is it possible to learn something meanwhile? And more important, Is it possible to enjoy such a trip? I would have said that it was impossible, but O’Lusitano, a Portuguese wholeseller based in Barcelona, organized the trip and gave me the chance to change my opinion. These two exhausting days that I spent there with some colleagues gave me an overall idea of what is going on in the Portuguese wineries. I will try to resume it following the notes I wrote at my diary and the stamp left in my memory. Early trip from Madrid to Régua (Douro). Target: to visit a vineyard at Douro valley and taste wines from three wine producers: Alves de Sousa, Casa do Cello and Anselmo Mendes. 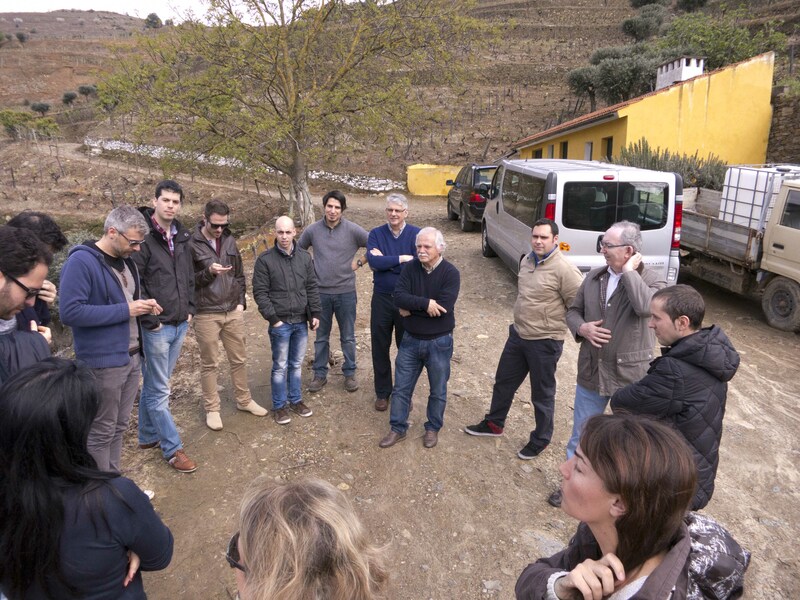 We arrived on time to visit the vineyards at Quinta das Caldas, owned by Domingos Alves de Sousa and his son, Tiago. 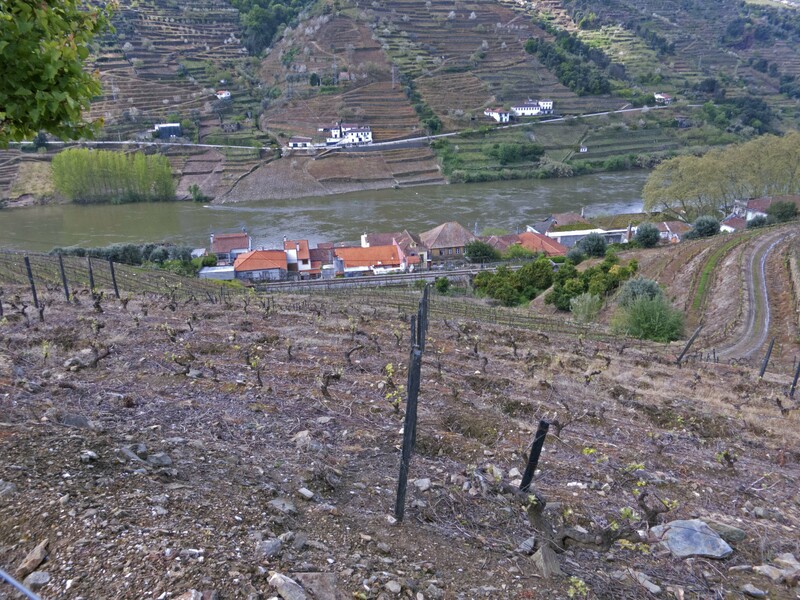 A terrific landscape all surrendered by vineyards. 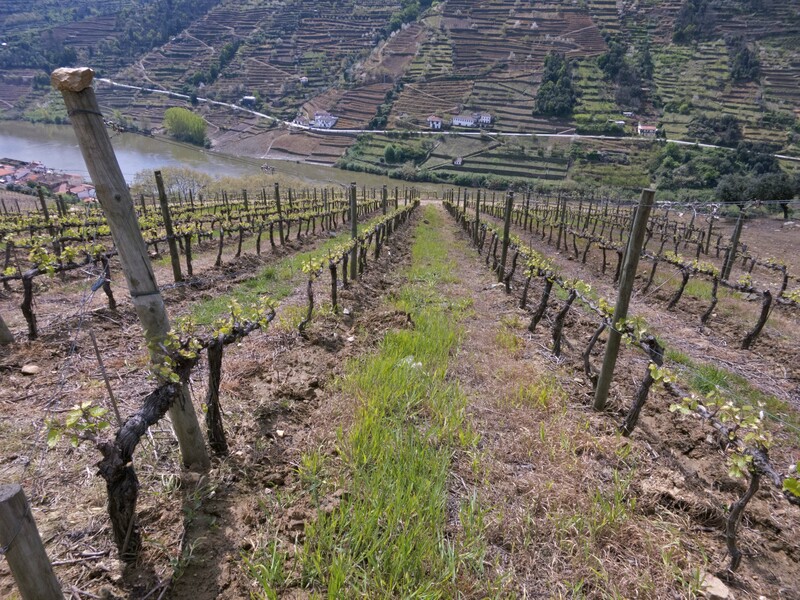 A human made scenery of stepped terraces where the vine is the queen and all efforts are focussed to attain a good bunch of grapes. 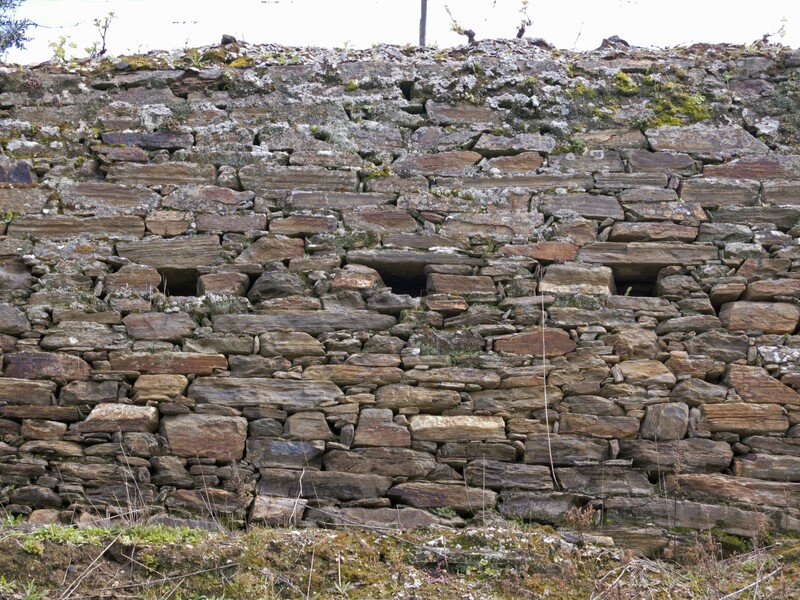 The wholes at the stone walls, the pilheiros, evoque a time when every available space was used to grow a vine. Alves de Sousa created his own winery buying five estates (Quintas) in 1987. 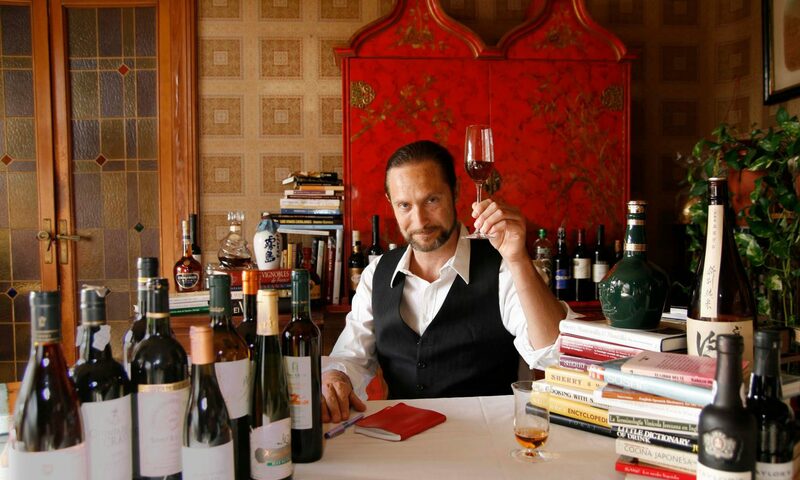 In 1991 Anselmo Mendes, a well known oenologist, joined the team. They use to say: “for the best wines, the best grapes”. To do so, the average yield is between 4.000 and 5.000 kg/ha; and some plots have been adapted as patamares which is nothing but areas set up for mechanization. They started to get official recognition from 1999. It was “late” (Portuguese have lunch quite early compared with the Spanish standard) and we moved to Régua to taste their wines and the ones produced by Casa de Cello and Anselmo Mendes while having lunch. We tasted plenty of wines of different geographical areas, i.e. Douro/Port, Dao, Vinho Verde and Vinho Regional Minho, from a pale white wine up to a Porto vintage. The result of the test was quite possitive. All of them passed the test without problems, and I realized that it is likely that -as a whole- Portuguese wines have an one of the best quality-price ratio in the world. I personally enjoyed Curtimenta 2011 and Anselmo Mendes Parcela Única 2012, two white wines produced by Anselmo Mendes at the DOC Vinho Verde. These full-bodied and mineral Alvarinhos are quite different in character from the ones produced in Galicia, Spain; and they are excellent for food-pairings. On the other hand, the wines produced by Casa de Cello and Alves da Sousa need time to express what they can offer, which is quite a lot. I would like to taste them again in two years, specially Abandonado 2009 and Memorias (in this one vintage is not mentioned) two red wines plenty of flavour. Port wines were simply great. We tasted Quinta da Gaivosa Porto White 10 anos Tawny -fragant- and the Quinta da Gaivosa Porto 20 anos Tawny -really good-, just to end up with a “child”, the Alves de Sousa Porto Vintage 2011 (ready to be enjoyed -which is not common for an early vintage such as 2011- and with a promising future). 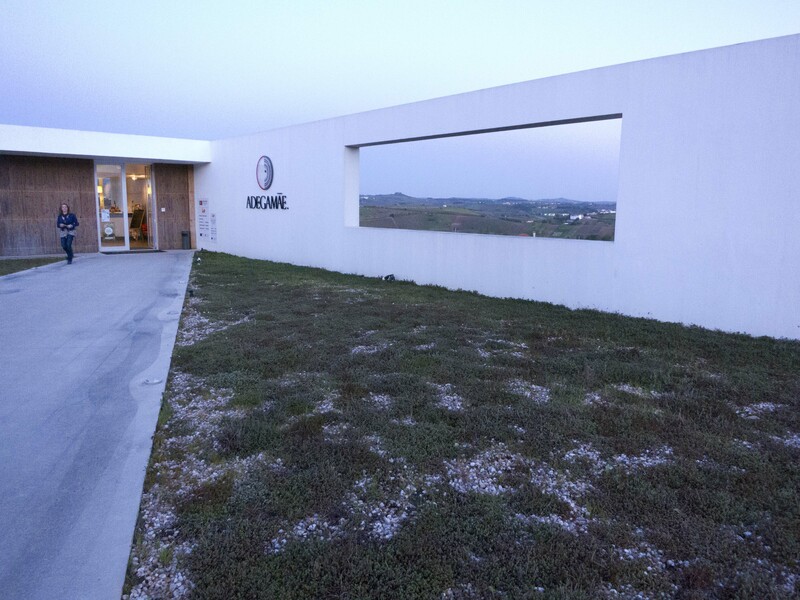 We drove up close to Lisbon to visit Adegamae, a state of the art technology winer ythat is working both Portuguese and international grape varieties. They are producing about half million bottles from young grapes of 4-5 years and they expect to reach a production of about 1.5 millions. We tasted 9 wines of two brands: Dory and Adegamae. I didn’t find any fault and I felt pleased drinking them. Among them, there were two that caught my attention: Adegamae V 2012 (Viosinho, an endemic white variety) and Adegamae T 2011 (a red wine made of Touriga Nacional, one of the best Portuguese red varieties). I think that the future of the wine industry pass through the singularity. And I think that this statement is valid worldwide. 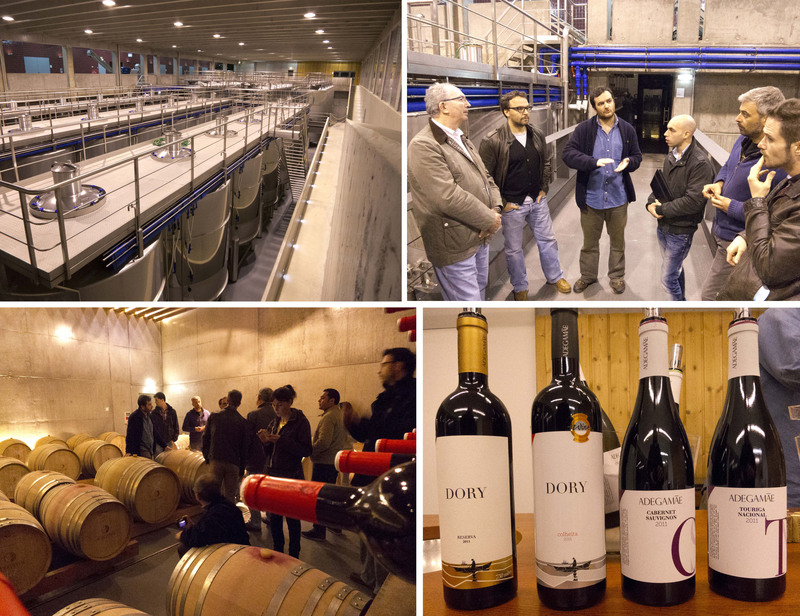 Both Viosinho and Touriga Nacional are varieties that will capture the attention of the media in the coming future. We left the winery quite late. We started the trip from Madrid just 18 hours before and I was having the impression to have been travelling for a week! 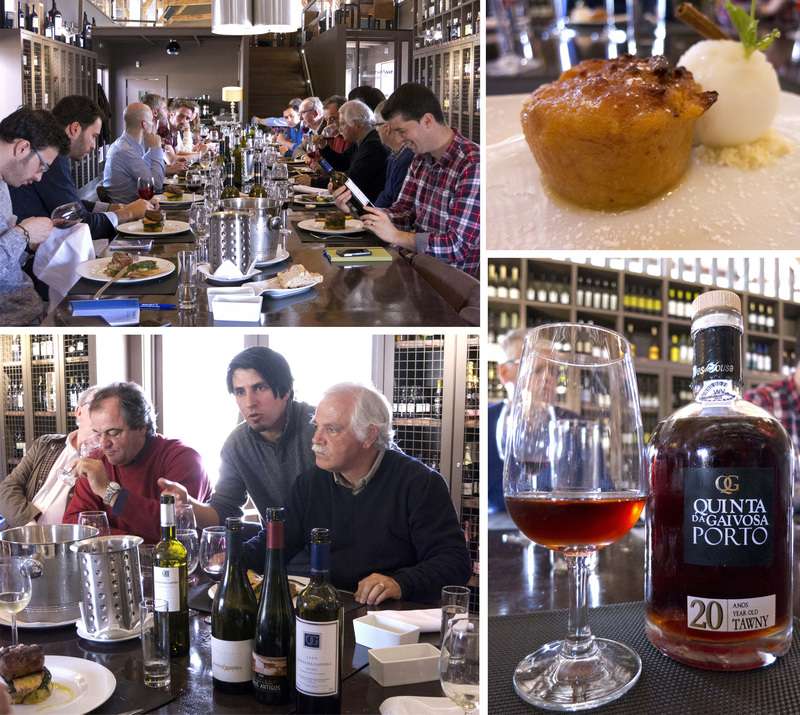 Good experiences in a very short period of time, hospitality, landscapes, people, wines, food… just a great day.